Mark your calendars, my darlings. In my humble opinion, this Friday 22 September marks the most awesome TGIF you’ll have this year: the Sun moves into harmonious, loving, fair, and partnership-minded Libra. That’s right, folks, LIBRA SEASON IS HERE! During Libra season, Universal energies are favourable towards the qualities that define the seventh sign in the zodiac. Libra is represented by the Celestial Scales: Libra is all about connection + relationships, balance + harmony, justice + fairness. Libra’s shadow qualities, like those of fellow Air signs Gemini and Aquarius, include: indecisiveness, restlessness, and emotional detachment (although Libra is the most emotionally in-tune of all three Air signs). Libra is ruled by Venus, the planet of love, romance, beauty, and partnerships. Libra loves to love! Couples, work with Libra’s sweet, loving energies and take your relationship to the next level. Singles, get in the game – there’s a heightened chance that you’ll find a soulmate during Libra season. I strongly recommend dating multiple potential partners before you make your mind up about one – Libra energies do best with a range of options and the freedom to choose. Libra is no pushover, though: this sign will also fight for a worthy cause. Libra season is a great time to discover your passion(s) – particularly if there’s a social or humanitarian aspect to it, like animal rescue or refugee rights – and to pursue them for the greater good. All in all, Universal energies are lightening up with the arrival of Libra on the scene. With that, let’s get to this weekend’s Oracle reading! Archangel Michael is known as the Upholder of God’s Truth, and the Keeper of the Faith. He’s a mighty warrior + protector Archangel. 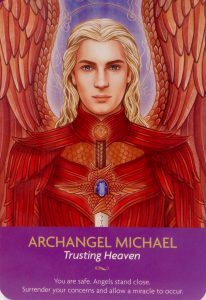 When this card appears, Archangel Michael’s message is to trust Divine will + timing in the challenging situation you may be facing. So keep the faith in your heart; choose to believe that the best possible outcome will happen. Consciously renounce fear (feel free to pray and ask Archangel Michael for help with this!). Then release your concerns to the Highest Light; trust that something wonderful + miraculous is going to happen. You are not alone. You are loved and watched over. Heaven has a plan and a purpose for you, so long as you are willing to make the right choices and stay on the path of Love, Light, and Truth. Peeps in Singapore: Kelly is back at Public Garden! 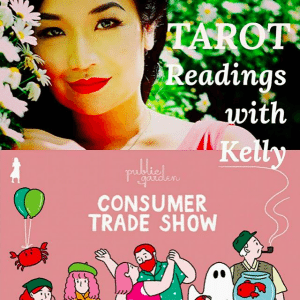 I’m giving Tarot readings this weekend at the Public Garden Consumer Trade Show! It’s at Suntec Convention Hall 403 on 23-24 Sep 2017 (Sat-Sun), from 1-7 pm. See you there!